Elijah wrote a great blogpost about our day visiting an elderly woman who was very close to the end of her life on earth. Here is a photo from the day we visited. A detail that Elijah did not include is that the caregivers for this very sick woman were two of her grandchildren who were about 8 and 15 years old. These girls were staying home from school to care for their grandmother. 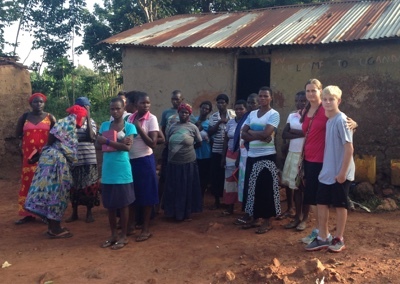 After the grandmother passed away, many members of our Bible study group went for the burial. Our family was out of town, so I was not able to attend. The following weekend, the 2 granddaughters came to our Bible study. They told the women that they hadn't been in school because they were caring for their grandmother, but now they didn't have the money for school fees and the supplies they would need to bring. I asked the women what they thought these girls needed. They all replied, "They need to go to school." We prayed for the girls. Then I asked the women, "What should we do? Who can help them?" They each began to offer what they thought they could contribute. Some asked if they could sell me an extra bead necklace this week in order to use the money for school fees for these girls. After the woman had all given what they could, we added up the contributions. It covered their expenses! I was so encouraged to see that the bead making skills these women have developed not only made it possible for them to care for their own children, but also to provide for the needs of others in the community. I was also very happy to see this small group of women serve together as the body of Christ. As I think about the little that these women have, I am blessed and overwhelmed by their generosity! Some of them were saving money to buy a mattress to sleep on at night. But they still gave to provide for these two girls! While I may have some things I am able to teach these women from years of studying the Bible, they teach me much more through the way they sacrificialy care for people in need. I am blessed to learn from them!